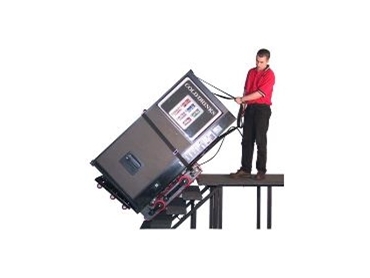 The Step Rider can lift up to 1500kg. HERCULES Complete Lifting Solutions has secured the Australian distribution rights for the Step Rider range of powered stairclimbers. Step Rider has been operating in the US for over thirty years and has developed a tried and proven product. The key feature of the Step Rider is that it uses 'caterpillar tracks' to enable a 'hands-free' operation so the user does not have to balance the load, which is the case with the powered hand trolley type stairclimbers. This means the Step Rider is incredibly safe to use with very heavy loads. The Step Rider comes in four models with capacities up to 1500kg.